"Brining chicken adds tons of flavor and keeps the meat moist. Several years of experimenting with ingredients and method and I finally found the right combination for my perfect chicken brine." 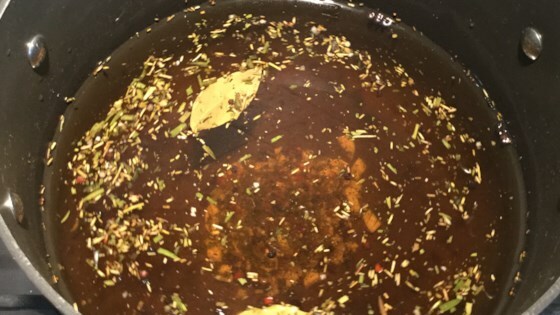 Mix water, kosher salt, white sugar, garlic, sage, basil, peppercorns, and bay leaf in a large pot over medium-high heat; bring to a simmer and cook, stirring occasionally, until the salt and sugar are dissolved completely, about 20 minutes. Remove pot from heat and cover with a lid. Cool brine at room temperature for 2 hours before refrigerating to cool completely. Cook time depends on heat source; could take more or less than 20 minutes to bring to simmer. Allowing the brine to sit at room temperature for the first two hours of cooling time steeps the dried herbs. I've found this makes a huge difference in the flavor. Let brine cool completely before adding chicken. Whole chicken can sit in brine for up to 8 hours. Chicken pieces (bone-in) can set in brine for up to 4 hours. After I brined chicken pieces for 4 hours I put in buttermilk for 2 more. It was the most moist, flavorful super crispy fried chicken I ever tasted. There were no left overs! The amount of kosher salt to water is spot on. That is the most critical aspect of a brine. The seasonings can all be changed up to whatever suits you. I reduced the quantity - only made 1/4 of the recipe for pork chops. Excellent. People - if you have time, brine your chicken and pork all the time. Really makes it moister! This was my family's absolute favorite brine! We taste tested a few and this one out-weighed them all! Yummy! Moist! Flavorful! It was the best chicken we have ever had. We hate breast meat and we LOVED IT!! What we didn't eat I made the leftover chicken in to chicken salad and the flavoring of the chicken was excellent.